Here in Central Virginia the arrival of summer is signaled by the arrival of the Hanover tomato. In Indiana it was the beefsteak tomato. If you’ve got great local produce, now’s the time to use it to create easy, flavorful dishes with bright flavors that won’t fade in summer’s sunlight. Last night we were guests at a wonderful dinner given by friends. I think that this simple side dish — a pizza in disguise — was the star of the table. It summertime; the livin’ should be easy. 1 large or 2 or 3 smaller tomatoes, sliced, but not too thin. Roll out the pie crust using a rolling pin or wine bottle until it’s nice and thin. Pinch the edges to make it look more homemade. Brush with some olive oil and bake it for two minutes in the oven. You don’t want it to get too crisp, but you want to help it stand up to the other ingredients without becoming soggy. Some skip this step. So if you forget it, don’t worry. Next arrange the slices of tomato, fresh mozzarella and basil leaves on the crust. Sprinkle with salt and pepper, drizzle with olive oil and pop it back in the oven until the cheese melts and browns a little. About 10 minutes? That’s it. Easy and really delicious, the tomato pie makes a great side dish or light luncheon. 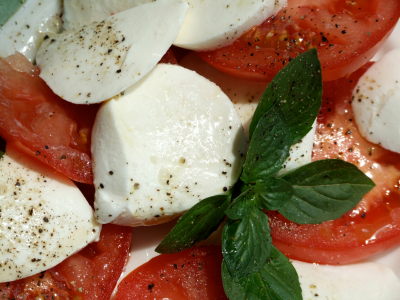 Without the crust, the fresh salad is called Insalata Caprese. Chop up the ingredients more, serve on toasted baguette slices and you’ve got bruschetta. Serve with a good white wine that is high in acidity and a little fruity (like a Sauvignon Blanc from New Zealand or a Gewürtztraminer from Pfalz) or a rosé like a Bandol. This entry was posted in Entertaining and tagged dinner, Entertaining, recipes. Bookmark the permalink. For some reason, the basil did really well in the recipe I made. Maybe it was drizzling the olive oil over the leaves? Good idea with the Parmesan; it certainly can’t hurt.